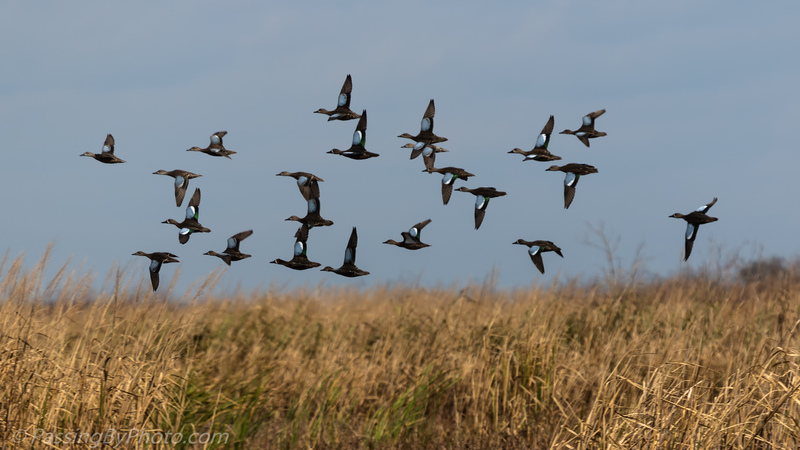 Last Saturday was a spectacular bird day at Bear Island Wildlife Management Area and these Blue-winged Teals were one of the many groups of birds I saw. The water had been lowered in some of the back ponds which attracts the wading birds, shore birds and migrating ducks. The reeds at the edge of the canals are above my head in most places so I did not have a clear view of the teals until they took off. When the Blue-winged Teals are in the water they are a handsome duck, but not as flashy as when they are in flight. You captured the BW Teals beautifully, Ellen! Thanks, Donna! I love to see ducks in flight, and a real bonus to get a focused image.